Elder Triceratops fan concept for The Isle. I like how the elder forms are similar to what a hypo version would look like. Yeah sort of an in between phase. I would say the Elder should look more like Torosaurus since they recently determined that Torosaurus is actually a Adult Trike but otherwise this looks great! I'm pretty sure there's not a consensus on that. Most of those assertions seem to have been made around 2010 or so. Saurian didn't take their adult Triceratops in that direction, and they've consulted with paleontologists and done tons of their own research. I may be wrong but what I know is the Saurian Triceratops is based on the T. prorsus Species. The one I was referring to that could grow into what we know as Torosaurus was T. horridus is the more popular one. There's evidence they're the same cause Toro has the same frill edge plates that the Trike has and if you look at the frill Triceratops horridus also has small holes forming in the bone which would get bigger as it grew. Not to mention when they cause into the bone and looked at the Bone density Triceratops horridus you'd see that it's bones where sponge like meaning it was still growing while Torosaurus was pretty solid which suggests a fully grown specimen. And since Torosaurus looks a lot like Triceratops horridus. So it would only make sense that the end result is that "Torosaurus" is the final stage of Triceratops horridus. As a side note, do we even know which Triceratops species The Isle's is meant to be? They're so similar, time is the main thing separating those two. Well I would say it's based on T. horridus due to the slight curve of the horns and if you look at it from the side it's frill has a small curve where if it was T. prorsus it''s frill would have a wide curve. 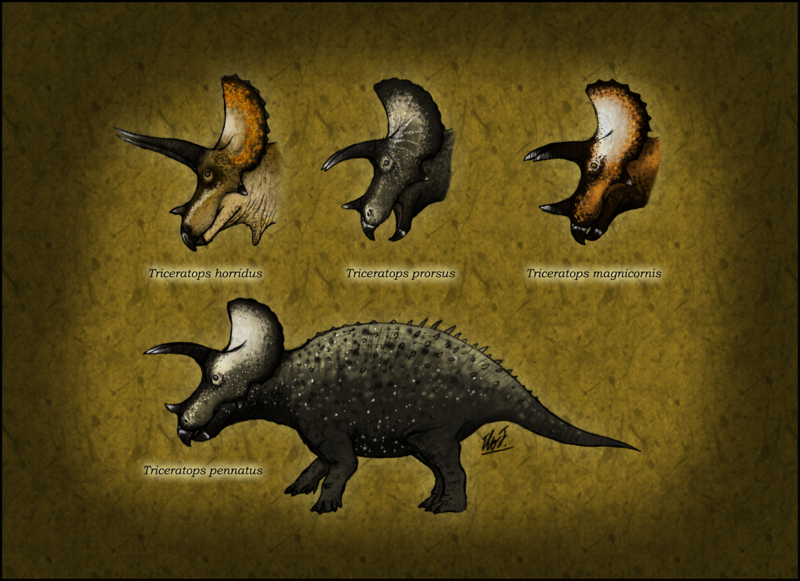 But you don't have to take it from me here's a picture someone on DA, by the name of TheJuras, had made of the apparent four different kinds of Trike with T. horridus on the top left and T. prorsus on the top middle. Also I've been busy but how about a Video from Jack Horner as he talks about what he calls "Shape-Shifting Dinosaurs" which was released February 9th, 2012? He does more then Torosaurus he also does Pachy and Nanotyrannus. I'm kinda discounting Jack Horner about it since it's predominantly his theory (I have watched his lecture on that topic before I believe though) The fact that we have very old Triceratops and then young adult Torosaurus seems to suggest they are distinct from one another. Perhaps it should be included as a species of Triceratops rather than its own genus, but I don't think it's entirely synonymous with the 2 Triceratops species we have. An over simplification is that horridus became prorsus over time. There could have been hybridization between Torosaurus and Triceratops though. I just don't think they represent old individuals of horridus. Like I said I could be wrong. But looking at two side by side they look very similar. All of these elders look pretty stylised in comparison to the game referenced images you've included. Its pretty jarring. I'm very jealous of the way you colour though! Just a side effect of me having a bit of creative freedom versus showing what's in game. Bit of a shame - it would be nice to see them in line with the other designs for a cohesive look but I reckon that's just me. They look more like redesigns than elders the longer I compare. If they looked too similar, there wouldn't be much reason to make a concept in the first place - the modeler would just make small edits like he did for the younger life stages without any conceptual references. I never said make the designs look similar, I meant style wise (more or less the only thing I've been talking about so far). Its doable, I think it would work a little better than the odd hodgebodge of styles you have going on currently but that's entirely my opinion - I still enjoy the concept. I'd rather just not show the earlier growth stages at all really, if the style difference is such a distraction. The real difference is because I rush through the growth stages that already exist to get them out of the way. It's a matter of time spent having fun on the elder versus showing the minimum for the others. It was just an observation/suggestion. Hey Emily? Can you do Tyrannosaurus? Because i'm super excited to see the Elder Rex! Can you have something where the elder Rex has a stronger bite and can swallow larger small prey whole? Anyway great work! I love this and I love your art! Keep up the good work! I'm probably going to save rex for last with these initial survival elders. Utahraptor, then Canotaurus, then probably Giga, then finally rex. Then any others they add into survival. I hate to bother you with something like this but a website has been illegally stealing art from deviantart users such as yourself for phone covers and selling them to people. Ah crap. Thank you for letting me know! Going to file a DMCA takedown asap. Very nice. However, why does the dark brown aspects of the adult form go grey while the light brown parts dull and darken for the elder? I would think the dark brown would keep getter darker if the rest of the progression is any indication. Mostly just because the darker it got, the more it obscured my details that I spent a long time drawing lol. It should get darker though. Call me crazy, but somehow I find this mature stage more believable than the Torosaurus-as-an-old-trike excuse. Just thinkin' out loud. Aha! I thought that horn structure looked familiar. And I totally agree. Mhm, at first I was just going to do downward facing horns like Saurian. But my elders have lots of speculative features so why not haha. Good, I thought it was just me. 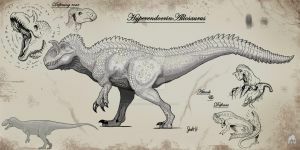 Love the osteoderms and horns, it looks really intimidating. Thank you! Grumpy grandpa trike for the win haha.